All this overview and logistical stuff! Whew! Before we go any farther, I want to give you at least a little taste of what Creative Energy Journaling is like, but I know some of you will not have had time to find a journal and supplies. Fortunately, you don’t need much for this activity. Just some paper and a box of crayons. Or, if you don’t have crayons, anything that will give you a little color—some markers, gel pens, colored pencils. You could even do it on the driveway using sidewalk chalk. This activity is easiest to learn with a partner. Even very young kids can do this activity with you. 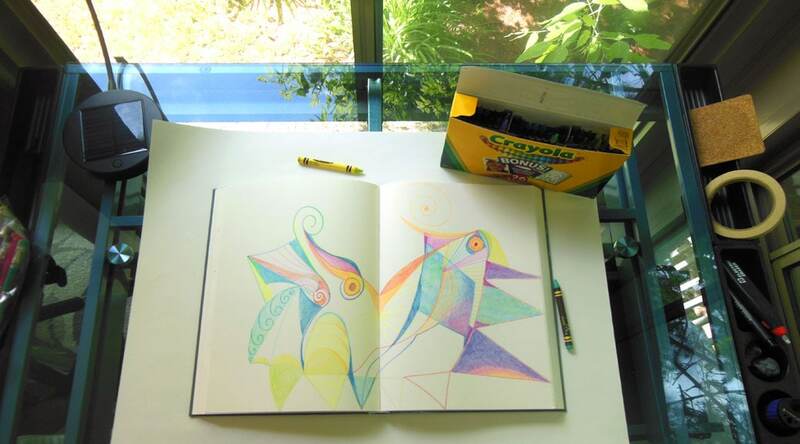 One person chooses a crayon (or whatever you’re using) and makes some marks on your piece of paper. Not drawings. Not words. Just some marks, like the beginning of a doodle. The first person makes marks for as long as she feels like it, and then puts her crayon down. The first person makes some marks. Then the second person chooses a crayon and makes some marks in response. Again, the second person makes marks for as long as she feels like it, and then puts her crayon down. The second person makes some marks responding to the marks the first person made. You simply go on alternating like this until you feel you’ve “said” enough, or until you run out of time. You’ll notice a lot of parallels to the give-and-take of a spoken conversation. Sometimes, someone will hold forth for quite some time. Sometimes, the exchange will be fast-paced. People sometimes respond to what went before by embellishing, imitating, elaborating. Other times, they may counteract previous marks, or change them, or even start a new “topic” in another area. You’ll discover there is humor and emotion, as well. There are no words, no pictures, nothing that we normally think of as conveying information. But something is getting communicated, and you’ll both know it. Crayon conversation, “completed” or at least paused. A crayon conversation done as a stand-alone exercise of a sheet of sketch paper. Another crayon conversation. I already see some interesting possibilities for using this one in a later exercise. You can return to the same conversation again, if you like. Or, you can use it as a Creative Seed (more on those in a later post) for a later activity. You can also play both roles in the conversation. You can use this to have a “conversation” between yourself in two roles you play in your life (for example, “mom” and “software designer”). Or between yourself and someone unavailable at the moment whose support and advice you’d like to have. Or between two imagined characters in a play you are writing. Tip: When I play both roles, I actually get up and go around to the other side of the table, so I don’t lose track of who’s speaking now! Another way to do this would be to get in character by changing your posture, putting on a hat, etc. Did anything surprising happen? How do you think a person’s style in spoken conversation compares to their style in a crayon conversation? Leave a comment by clicking the “Leave a Comment” button under the title of the post and share your experiences! Disclaimer: I’m pretty sure I got the general idea for this from someone else, and adapted it. I think the germ of the idea was Linda Capacchione’s famous “other hand” art therapy activities. As I recall, there is an activity in which one conducts a (written) dialog between the right and left hand. I believe I took that idea and adapted it to a nonverbal dialog between two people. But if anyone is aware of a more closely related activity and can give me a reference, that would be great! I’ve used some of these activities for so long that it’s hard to remember how I got started with some of them, but I want to be sure to give proper credit for any that I picked up from someone else.